There are times in a computer’s life when air cooling will no longer fit the bill. Unfortunately, most main stream computer users are sometimes afraid to experiment. This should no longer be the case because water and electronics were meant for each other. If you have been following computing, things have been changing, duh. As things get faster, they require greater cooling. As things got faster, heat sinks got bigger and bigger, making more noise than my grandmother in the bathroom. For this reason, some of us have ventured into mixing water and electricity to bring the noise down and the speeds up. 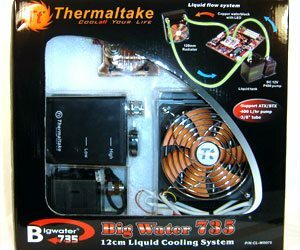 Thermaltake is not new when it comes to cooling, and now they are trying to do what they do best, bringing what the enthusiasts have been doing for years to everyone else. 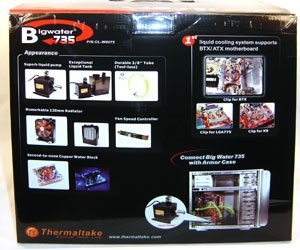 Enter the Big Water 735 complete water cooling solution. To introduce this unit, Tt is true to form with another loud box, and another low price tag (this system can be had for under $125.00 US). The black box is home to a pump, a water block, a reservoir, tubing, and a bunch of screws/mounting equipment. The CPU water block has a universal mounting system that allows it to be used in nearly every system. The reservoir and pump combination in this system is reminiscent to some of the classic components in “ol’ school’ water cooled configurations. Some of the early pond pumps used in those systems were usually configured with attached reservoirs just as this one is. The reservoir is clearly marked with “high” and “low” water level indicators and features a rather large fill cap. I would have been happier if Tt had provided us with a funnel for filling it as it can be somewhat difficult to fill the reservoir when installed in your system. It is nice to see that they didn’t go nuts with the logos and decals on these! The pump is capable at pushing 400 Liters (about 105 gallons) per hour in optimal conditions.